Typical Job Costs:Every job is different and can vary. Call for details. 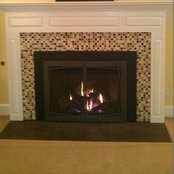 I used Penguin Fireplace to put in my new gas log set and new metal face and screen set. Fits like a glove and looks beautiful. I'm very happy with the final finished product. Would recommend them.